Ask your children what sport they'd like to try, and try to find a way to make it happen. Get inspired as parents -- model an active lifestyle yourself and encourage your children to get active. The Olympics are a 4-year energizing catalyst to the imperative that we need to support this nation's children to get inspired and to get active. Canadian Paediatric Society National association of paediatricians, committed to working together to advance the health of children and youth. These Olympics in Rio reached me in a deep way. 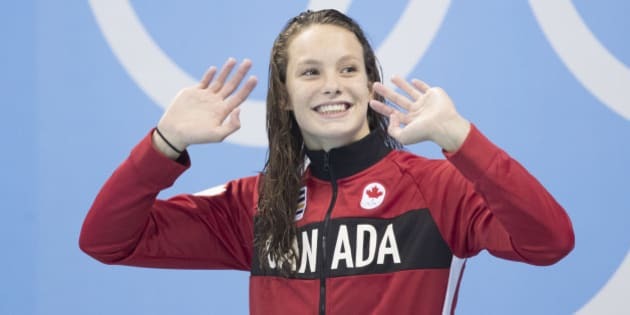 It was in watching the likes of the humble 16-year old Penny Oleksiak win four Olympic medals, in hearing Andre De Grasse's story of serendipitously finding himself at a school track meet at the age of 17 and settling into the blocks in an Olympic sprint final 4 years later, and in reading the ever-gracious Adam van Koeverden's articulate and thoughtful reflections on what kayaking has meant to him. These athletes, and so many others, are heroes. My heroes. I was wholly inspired. And that feeling reminded me of being a kid. I'm a pediatrician. I've been asking children and teenagers what they got from watching the Games. The answers have been varied, but they all in some way relate back to the child him/herself. This struck me. While I understand child and adolescent development and its appropriately self-focused chapters, what struck me most was the Olympics' powerful ability to inspire and motivate, and how we need to harness this for our children and youth. Olympic athletes inspire. There are a number of ideals that underlie the inspirational capacity of high-level sport -- recognizing the value of hard work and dedication, overcoming adversity, and making sacrifices. Children are particularly impressionable for several admirable reasons -- they are open-minded, they have great imaginations, and almost invariably, they see beauty in anything new. I believe that inspiration for children, maybe more so than with adults, is also rooted in identification and relatedness with another. Every child can identify with some athlete's story -- the small town success, the multicultural nature of the Canadian team, or the athlete competing with a disability. These athletes inspire us to become better people. The Olympics are all about young people inspiring young people. Inspiration leads to imitation. Children are great emulators. The mantra of inspiration and imagination "I can see myself doing that" is a fundamental motivator and needs to be nurtured and supported. In the beginning, we get better by copying others. We imitate the skills of the game, and in so doing, learn how it's done -- from the hard skills of the strokes, the stride or the shot, to the soft skills of the sportsmanlike approach. Children connect to feelings and stories. The Olympic journalists and reporters fill an already action-packed schedule with stories and details about athletes' personal lives, families, struggles and triumphs. (Often with a flair for the dramatic and set to energizing music.) We all love the stories as they add such richness and personal depth to the performance. In classrooms all over this country, children write to athletes because they feel like they know them. Children love stories. The Olympics provide children with the important gift of feeling national pride. I remember those early feelings of nationalism as a child -- seeing the maple leaf on jerseys, hearing the Canadian anthem on the podium, and watching the Canadian athlete contingent march in at the opening ceremonies. The first swelling of the heart in seeing Canada's place on the world stage. Unity is tangible for kids -- to see the country united and teams coming together is compelling. We teach kids to be proud. And we've got lots to be proud of, and grateful for, in this country. Kids respond to feelings. They get interested in new things because they feel inspired, they enjoy it, they sense achievement, and they feel proud. Those feelings are the hook, and if they're positive, kids will be motivated to continue. Adults and parents (particularly if they've been athletes themselves) see the potential for life long lessons of commitment, tenacity, and goal setting. Those are the rewards offered during the journey, but not the hook. The Olympics has valuable lessons and role modelling to teach. Let's think about how much children learn from watching others. Everything. That's how we teach as parents, as coaches, as classroom teachers, and as athletes. Olympic athletes are all role models. On the raw and grand stage of sport, they show what it means to be sportsmanlike, to deal with elation and disappointment publicly, and to treat others with dignity and respect. Few experiences offer the opportunity for children to witness values of humility, diplomacy, and perseverance in such a captivating way. Every post-race interview with an athlete speaks to the virtues of hard work and determination for success. Kids recognize that athletes themselves drive and determine their own success, with support from parents and coaches. In an era seemingly dominated by professional sports with its too oft-associated showboating, advertising and aggression, the Olympics are sport distilled to its purest, and its athletes have valuable lessons to teach. How do we continue to revel in this Olympic high? Get your kids outside and active and imitating these athletes. Get physical education the recognition and place it deserves in our schools. Tune into the Olympics and other sporting events and talk about it. Bring the Olympics to your kitchen table discussion. Share these athletes' stories. Point out different ways the Olympians treat each other with respect. Ask your children what sport they'd like to try, and try to find a way to make it happen. Get inspired as parents -- model an active lifestyle yourself and encourage your children to get active. The Olympics are a 4-year energizing catalyst to the imperative that we need to support this nation's children to get inspired and to get active. As I noted above, I'm a pediatrician. I haven't yet mentioned childhood obesity, despite feeling very passionate and concerned about its significance and consequence. It disturbs me that the problem of childhood obesity has been relegated to clinics and doctors' offices. It's not solved in a clinic. Obesity is a complicated problem addressed by sound policy, education and cultural shift. And that shift, in the eyes of a child or teenager, can start with being inspired and having good athlete role models and supportive parents. Let's use the lessons and opportunities that our Olympic champions have so generously offered to our children and to us. Dr. Anne Rowan-Legg is a consultant Paediatrician at the Children's Hospital of Eastern Ontario and Renfrew Victoria Hospital, and the CPS Special Advisor on Resident and Community Paediatrician Engagement.